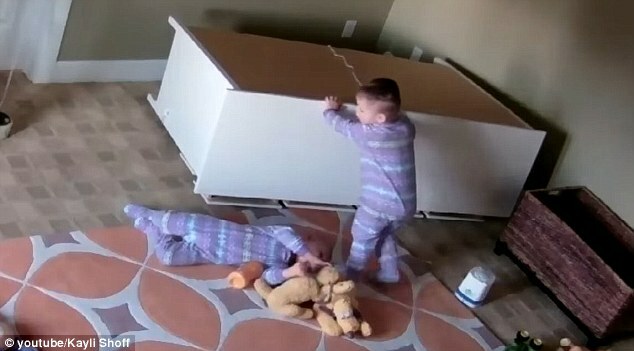 A two-year-old boy has saved his twin brother from being crushed beneath a fallen dresser by pushing the dresser so he could roll out. Toddler Brock Shoff was playing in his bedroom when a dresser tipped over onto him while his brother Bowdy and the security cameras were watching, the Daily Mail reported. Brock was crying as the dresser had pinned him to the floor, with no adult in sight because his mother Kayli went upstairs for a moment. But Bowdy soon came to his rescue, trying to lift up the dresser with his bare hands. When that plan did not work, he pushed the dresser so it slowly moved off Brock. Meanwhile, Brock was able to roll from underneath the dresser. The video ends with Brock crying as his brother Bowdy turns to him, but according to Kayli, both boys were recovered and playing together by the time she returned. Ricky, the father, posted the video to Facebook to bring awareness about falling dressers. “I’ve been a little hesitant to post this. But I feel it’s not only to bring awareness, but it is also incredible,” he wrote. “We are so grateful for the bond that these twin brothers share. We know Bowdy was not alone in moving the dresser off of Brock. And feel blessed that he is ok. Please make sure all your dressers are bolted and secured to the wall,” he continued. Other toddlers harmed by falling dressers have not been so lucky. 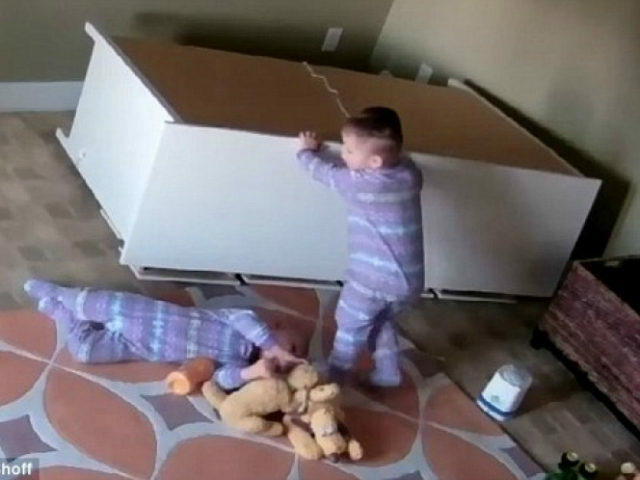 Three toddlers were killed by falling dressers from IKEA, causing the company to pay $50 million in a settlement to their parents in December, six months after recalling 29 million IKEA dressers, Inside Edition reported.